1. Convert video and audio between almost all the popular media formats including WMV, ASF,AVI, RMVB, FLV, RM, MOV, QT, MP4, M4V, DV, 3GP, 3G2, DAT,MPG, MPEG, VOB, FLV, MKV, MTS, M2TS, F4V ; and Audio Formats: AAC, AC3, AIFF, AMR, M4A, MP2, MP3, OGG, RA, AU, WAV, WMA, MKA, FLAC,etc. 2. Compatible with various devices such as iPad, iPod, Zune, iPhone, Apple TV, PSP, PS3, Blackberry, Xbox 360, Archos, iRiver, Motorola, Creative Zen, MP4/MP3 Player, Smart Phone, Pocket PC, Mobile Phone,etc. 3. Convert video/audio formats files to DVD/VCD/SVCD formats as output and preset DVD menu. 5. Personalize videos by editing and appending effects and customize the subtitles of your own style. 6. Easy, quick and convenient to convert and batch conversion with super fast conversion speed and high quality. Qweas is providing links to WinAVI All In One Converter 1.6.3 as a courtesy, and makes no representations regarding WinAVI All In One Converter or any other applications or any information related thereto. 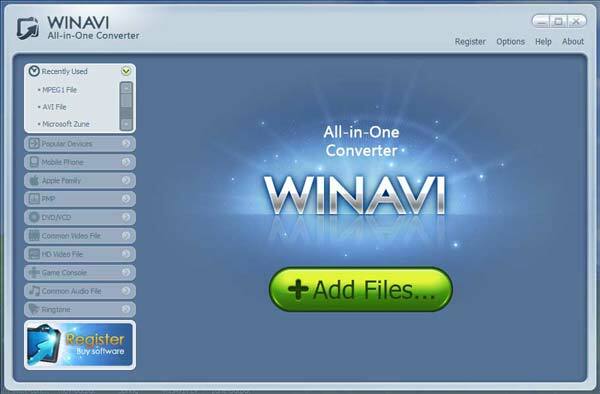 Any questions, complaints or claims regarding this application WinAVI All In One Converter 1.6.3 must be directed to the appropriate software vendor. You may click the publisher link of WinAVI All In One Converter on the top of this page to get more details about the vendor.